Electronics devices are a key support for our ever-developing and ever-evolving advanced information and multimedia society. We supply sundry products responsive to customer needs, including a host of well-proven semiconductor and electronic parts. 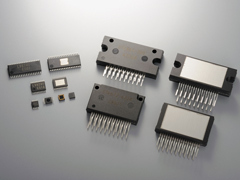 We also supply the power-integrated circuit boards indispensable for the motors used to control precision machines such as a copy machines and printers, laser diodes vital for surveying equipment, conductive polymeric capacitors with low ESR, and the power MOSFETs used in power tools and electronic parts for digital cameras. 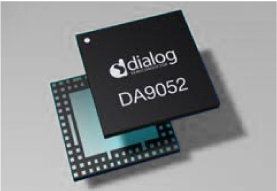 Furthermore, the products of Dialog Semiconductor, who is the leading company in the field of power supply IC, is one of our handling items. Therefore, we are anytime ready to meet adequately customers requests. For non-listed products please contact Electronic Devices Sales Department at +81-3-5701-1117. Our main lineup relies on “high function” components and strategies such as 8bit/16bit micro controllers, simplified USB host micro controllers, “low noise designs” with fabricated patterns for EMS/EMI countermeasures, and flash micro controllers through the use of “low-power-consumption” technology. 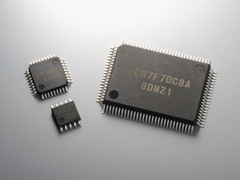 Our outstanding memory devices include the world’s most compact and reliable EEPROM (most suitable for mobile equipment) and the world’s fastest NOR type serial flash memory (ideal for reducing system cost). We are developing a wide range of packages for various applications, including ultra small transistors to help save resources. 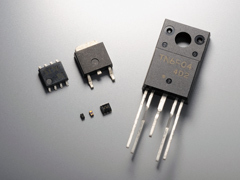 Our high-voltage products and Ultralow-On -Resistance MOSFETs have special features. We provide a total lineup, from bipolar drives to unipolar drives, with detailed consideration of AV/OA devices. Our motor drivers are distinct for their versatile applicability for both cellular phones and digital cameras, for their compact, high-function designs, and their high usability with only a few external parts. 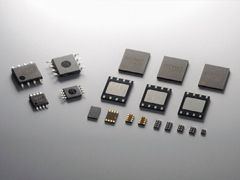 Supply ICs amenable to downsizing and efficiency improvement can be used as power supplies in all kinds of products, from mobile game machines to AV/OA devices. 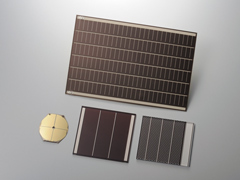 Solar cells of various voltages and shapes can be created and applied for sundry uses — even as visible light sensors. These environment-friendly products require less energy to manufacture and use less material compared to crystal silicon solar cells. Adapted to the power supply of various type of mobile products such as smart phones or tablet PC. Smooth power supply control achieves thorough low power consumption as whole set including peripheral, which makes the best of maximum battery drive. 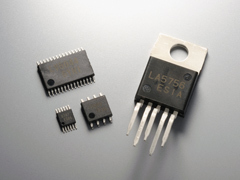 Chipsets or modules of DECT standard products in wire-less IC are also available. POSCAP and OS-CON realize low ESR using conductive polymeric molecules. 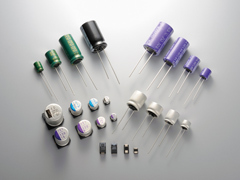 Our lineup includes aluminum electrolytic capacitors with long life and low impedance.